Well, if you would have exploited that vulnerability in my phpMan utility like someone else did you could have read my /etc/passwd file on the web server and would have found my name in the comment section of the userid. :) I have since removed anything from the password file that has any personal information and I don't think there is any other shred of personal information anywhere else on the server so if someone breaks in to the server they won't get anything. On a side note, my friend brought in a brand new ATX power supply for me today (I gave him 15 bucks for it) so I should have the old slow server back up this evening. or you could just be nice and tell us the info. That would be so much easyer. But i think ur GOD who else knows this much about linux. I dont think linus knows everything you know. Yeah right, Linus is the man! Although when it comes to anything other than the kernel he doesn't claim to know much about Linux "the distribution" (GUIs etc). But he is a humble guy who doesn't like to take a lot of credit for anything. I would say he is the polar opposite of Michael Robertson (Lindows CEO) who isn't responsible for contributing much at all to Linux but loves to put and see his name in lights. i agree, but it's funny to think people would be disappointed to know your real name, does this mean you are somebody i might have heard of extracurricularly? would i be disappointed to find out for example that you are ted nugent, or jed bush, or bill cosby or michael jackson, in fact are you one of those guys? Yes, I am all of the above. :) No, I am sure nobody here has ever heard of me although if you knew my name you certainly would be able to find a lot of my real life on the internet as well. But seriously, people would be disappointed (if they were expecting someone well known in the Linux arena or other). 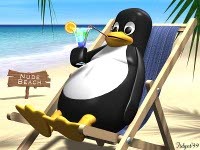 I am just a Linux fan like most everyone else here who wants to contribute in any way I can. This is how I choose to "give back". Ok, voidmain.is-a-geek.net is back on the old piece of junk PC. I had to do a little modification to the power supply though. I forgot to mention that the machine is a mini-tower case and the ATX power supply must have been a mini-ATX power supply (if there is such a thing). The PS case was larger and the power cables came out the back rather than the bottom so I hacked the case to make them come out the bottom. Also had to remove a quick mount drive bay and just lay the main hard drive in the bay unmounted. :) I'm a regular Rube Goldberg! i had to do all that crap to my power supply not long ago. it takes some rubbish size of power supply they don't make anymore so i had to get one a bit smaller and the wrong shape and secure it using many bits of string. Ok, after hacksawing the power supply in I've been getting kernel panics more rapidly than before. I am also getting a lot more traffic which is what I think might be triggering it. I believe I have some sort of hardware problem and I probably just should have ditched the machine like I wanted to do rather than buying the new power supply. I think those processors are based on the old Cyrix processors. And as if by coincidence http://www.theregister.com/content/3/35445.html some more info. I am thinking the best things in those links void was the case. Those cases actually go for around 50$ a piece. I would reccomend the case then actually getting a slightly better motherboard/cpu. Also do you allready have ram or would you need that to? Actually I just bought the case, motherboard/CPU, PS, and 256MB of RAM for around $120 after rebate. It should be good enough for this server. It's been crashing like crazy lately, was down early this morning and a couple hours this afternoon. Certainly bad hardware that is slowly getting worse and I've had several different kernels on it all of them will panic. The new machine should be here in a week or so (UPS ground). If it was for a desktop machine where I would be running X I certainly would go with a much higher end machine. Ok, voidmain.is-a-geek.net is up on the new machine, just finished switching it out. I don't know if they made a mistake or not but that case is *awesome*! I'll get a picture of the old and the new machine next to each other and post here in a few minutes. The new case is pretty large and has bays out the ying yang, very nicely built. The bays have little levers that allow them to pop right now. One side is has a clear panel in it. The puny little motherboard looks pretty funny in there all by itself. I only moved one hard drive into it and no floppy or CD-ROM. Talk about bare bones! I'll keep the other hard drive in the other machine as and have a working spare. Not too shabby for $120. The case, motherboard and CPU were ~$60 (after rebate, which I haven't mailed off yet). Then another $60 for a 256MB memory stick (just doesn't seem right compared to all the other stuff I got for $60).